This poems had its beginnings, oddly enough, in some reading notes on the Iliad, in particular the spectacularly violent episode in which Zeus and Hera argue over the fate of Sarpedon and the role of divine intervention in human battle � should they allow his life to be extinguished? That seems very far in the background now, hardly part of this text. The poem took its final shape as I became very close with a friend as he grieved the death of his murdered girlfriend. Founded on the loss of someone I�d never had the privilege to know, our friendship was openly both discomfittingly and comfortably haunted. This poem, insofar as it can be considered a representation, stands in for my continual lost encounters with that girl and my experience of and strange identification with his extreme grief. I was always aware that the sense of loss I came to feel was highly mediated. The text�s return to its own material surface, visually and aurally, seems to stem from losing what I never had, what was never mine to break over. it adds up to zero. 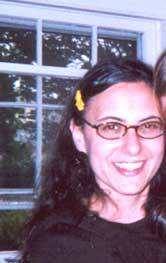 Bio: Judith Goldman is a Ph.D. candidate in English and Comparative Literature at Columbia University. She is the author of �adversities of outerlife� (chapbook; Poet�s coop 1996) and Vocoder (Roof 2001). She has recently relocated to Berkeley, Ca.